Dropps are these little convenient pouches or pacs that you can simply "dropp" into your washer before you start a load. Dropps pacs are available as baby detergent, everything else wash detergent and fabric softener. The special thing about Dropps fabric softener pacs is that they are made with natural minerals, these minerals flow through the delicate fibers in your fabric to leave them smelling fresh and clean. Most other fabric softeners work by coating and clogging the fibers, creating issues for your clothing later on down the line because the fibers will break down faster PLUS all that gunk that builds up is soaking into your skin as you wear the clothing! I've been using the Wild Orchid scented Dropps with our clothing. The scent is lovely and everything seems to end up feeling extra soft, even the towels are fluffier. I like that it is so simple, I just have to just drop in one detergent pac and one softener pac. If you like to machine wash your swimsuits or flame retardent pjs, Dropps softener will not harm them. 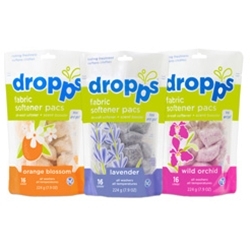 Dropps softener pacs are available in Lavender, Orange Blossom and Wild Orchid scents. Dropps will be a sponsor in Summer Splash beginning May 14th through the 27th. Be sure to come back to win some Dropps softener pacs.